How we’re working to prevent abuse of the review system and speed up publication of your customers’ testimonials. What about customers who don’t use the internet? The old-style paper review cards are being phased out over the next few weeks as we continue to improve the customer review process. They’ll be replaced by new cards that you can give to your customers which tell them how to leave a review on our website or by calling us. Prevent abuse of the review system: we want to make sure all reviews are submitted directly to us and can’t go astray. It’s harder to ensure this with paper reviews and this isn’t fair on traders or customers. Increase confidence in Trusted Traders: by removing the potential for abuse, your customers can be more confident in the reviews and the reputations of Trusted Traders. Speed up publication: using paper and post can mean it takes several days for a review to go live. Switching to online and phone will enable reviews to be posted more quickly. Your customers no longer have to log in or register to write reviews, thanks to improvements we made to our website in December 2018. 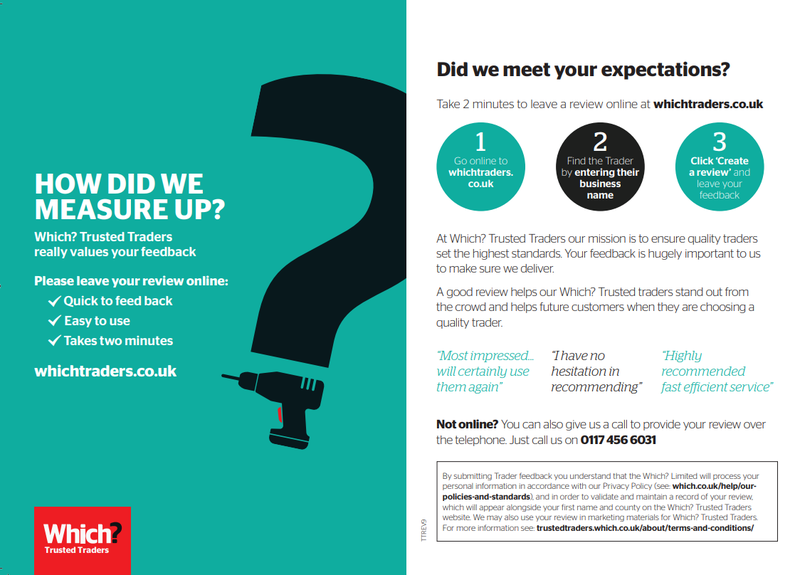 Following feedback from traders and customers, we streamlined the online review process to encourage more people to take part. Reviewers simply have to provide some contact details to enable us to verify that the review is genuine. You can reassure customers that we still offer an ‘offline’ option: they can call us on 0117 456 6031 to provide their review. We have a dedicated team on hand to take the calls so we can get the reviews posted as quickly as possible. Details of how to call us are included on the new cards that we’ll be sending out to you. We pride ourselves on moderating 100% of our reviews to make sure they comply with our terms and conditions. This can involve checking IP addresses, speaking to the reviewer on the phone and requesting documents relating to the work such as proof of purchase. While no system is fail proof, we will always seek to reject and hide reviews if we don’t believe they are authentic. We are constantly looking for ways to streamline our processes to enhance our moderation process further. Contact your account manager to order the new cards or if you have any questions about the changes. Did you know you can show off your Which? 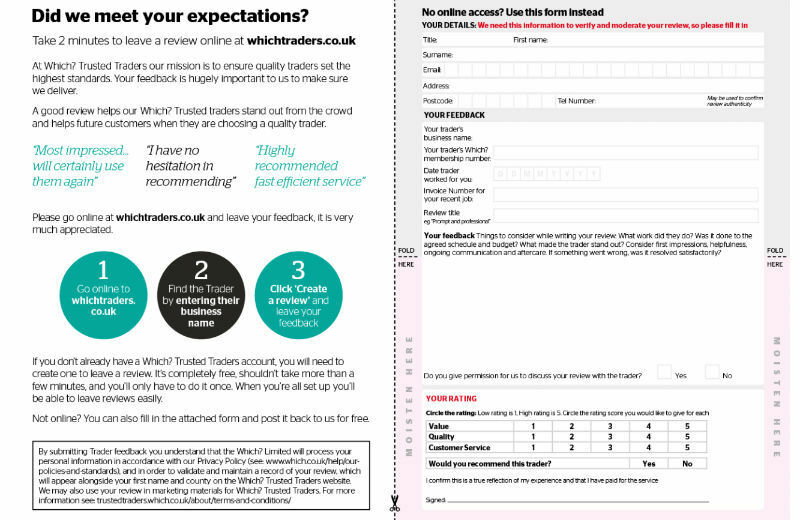 Trusted Trader rating on your website?